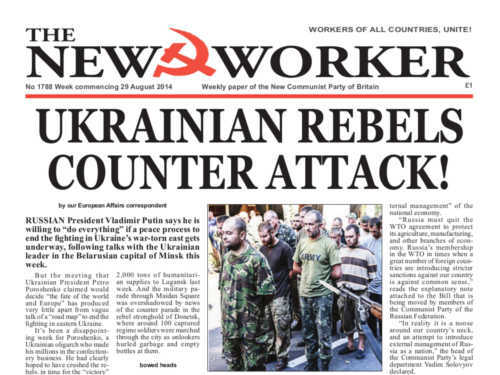 www.newworker.org | 29th August 2014 - Ukrainian rebels counter attack! RUSSIAN President Vladimir Putin says he is willing to “do everything” if a peace process to end the fighting in Ukraine’s war-torn east gets underway, following talks with the Ukrainian leader in the Belarusian capital of Minsk this week. But the meeting that Ukrainian President Petro Poroshenko claimed would decide “the fate of the world and Europe” has produced very little apart from vague talk of a “road map” to end the fighting in eastern Ukraine. It’s been a disappointing week for Poroshenko, a Ukrainian oligarch who made his millions in the confectionery business. He had clearly hoped to have crushed the rebels. in time for the “victory” parades in Kiev and Odessa on Independence Day on Sunday. His troops and the neo-Nazi militias were pounding the rebel capitals of the breakaway republics of Novorossiya while a Russian humanitarian relief convoy was held for 10 days on the border by Kiev officials. THE PUBLIC sector union Unison has called on the Department for Business, Innovation and Skills (BIS) to publicly name and shame councils who commission social care employers that flout National Minimum Wage laws. BIS has recently started naming companies who don’t pay the minimum wage, but it has not mentioned the role of councils that are also implicated. In a letter to Secretary of State Vince Cable, the union has urged BIS to team up with the Department of Health to introduce tougher measures to combat non-compliance of minimum wage legislation in social care. THE FIRST stage of the Scottish independence referendum has begun. Anyone living in Scotland aged 16 and over on 18th September, who is registered to vote, can take part in the ballot. Some 700,000 Scots received their postal ballot papers this week. The rest will go to the polling stations on 18th September to vote on the question of whether Scotland should be an independent country. If Scotland votes yes, then talks will take place over transferring powers from Westminster to Holyrood, with 24th March 2016 pencilled in as Scottish Independence Day. The debate has dominated Scottish politics. The pro-independence Yes campaign has naturally been led by the Scottish National Party which runs the devolved Scottish government and holds the majority in the Scottish Parliament, while the opposition Better Together platform is dominated by the Labour Party that governed Scotland in coalition with the Liberal-Democrats until its defeat at the hands of the SNP in 2007.